Dogs, Donuts, and Austin food trailers. Can it get any better than this? Since there was no school last Friday, the parental units and I decided to have lunch at one of the many amazing food trailers in Austin and then take the dogs for a walk on the no-leash-required side of Lady Bird Lake. In other words, it was going to be an awesome day. While I know donuts fall into the completely unhealthy food category, they also fall into the every-once-in-a-while-can’t- be-too-bad justification category as well. The truth of the matter is, ever since we attended the Gypsy Picnic food trailer fest a year ago, mom has been obsessing about Gordough’s Donuts. Why? Well, the line for their Big. Fat. Donuts. at the Gypsy Picnic was 50 people deep. If people are willing to wait 30-40 minutes for a freaking donut, then they must be sprinkled with a magic ingredient. Or…perhaps it might be the sugar-laden flour, fried in deep fat deliciousness, smothered with sweetened cream cheese and then topped off with fresh fruit that makes you “forget” you’ve just ingested an entire days worth of calories in a single sitting. Besides, even Anthony Bourdain from “No Reservations” has eaten here, so don’t get too “judgey” OK? I’m just saying, that might have been the reason why the line was so long. In the end, it was the long lines (and the fact that we had already stuffed ourselves with other yummy treats that day) that kept us from partaking of this nutritionists’ nightmare delicious treat. 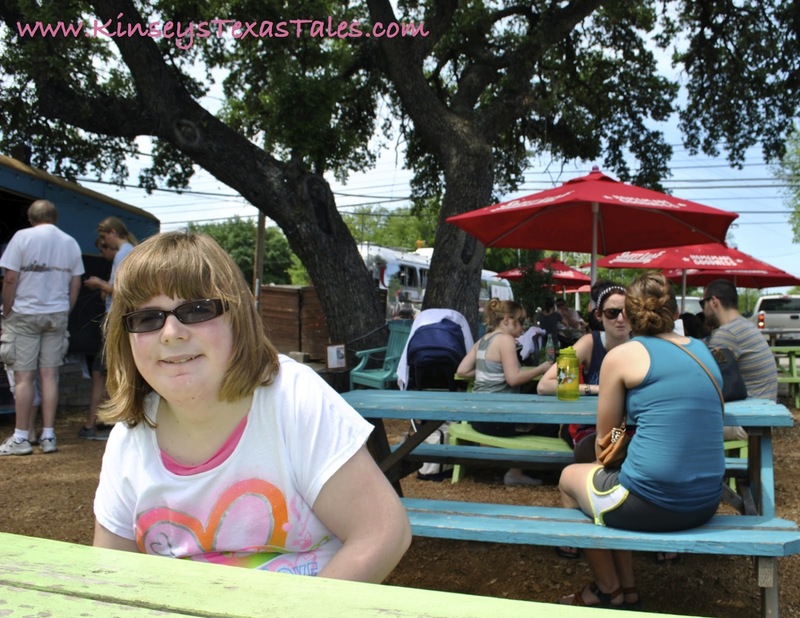 Until last Friday that is, when mom decided that we should all succumb to the siren’s call of a Gordough’s Donuts.As we stood before the gleaming Airstream trailer, we were burdened with the formidable task of what to order. Should we get something savory like the Flying Pig (plain cake donut, topped with maple syrup and strips of fresh, crisp bacon) or should we order the Funky Monkey (a plain cake donut topped with cream cheese icing, brown sugar, and grilled bananas)? So while my parents vacillated back and forth on the merits of sweet versus savory, I tapped my dad on the shoulder and pointed to Dock and Roll Diner food trailer a few yards away. The solution was so simple, I couldn’t believe I had to point it out to them. “Dude, divide and conquer.” I put my dad in charge of ordering the sandwiches, mom was going to pick the donut and I was in charge of the dogs. Easy Peasy. The Dock and Roll Diner does business out of a 1957 Flying Cloud Airstream. How awesome is that?! Dad ordered the Infidel Castro (their version of a Cuban sandwich) and the Blue Bahn-ett, an Asian inspired smoked pork sirloin sandwich that was so good it’s hard to believe it came out a trailer! Toby really wants a bite of the Infidel Castro! But the Blue Bahn-ett was incredible! Now that lunch had been dispensed it was time to bring on the Gordough’s Donuts! And OMG, did my mom bring it on. She still couldn’t decided what to get so she ordered TWO! Yeah, I know – INTENSE, but TASTY! And boy, did the sugar shoot directly to our brains. We did show some restraint and only ate half…of each one…split 3 ways. So that’s not SO bad is it? Of course, after eating that we had to walk around the lake to burn off some of that sugar. The dogs loved being off-leash and chasing squirrels. But they refused to get in the water, like all of the other dogs! The closest Chloe got to the water was watching other dogs jump in.